We started excavating amber in Wyoming in 1997, Dr. David Grimaldi and Keith met with Dr. Lillegraven a geologist from the University of Wyoming and explored coal/lignite exposures in a most unusual geologic area that Dr. Lillegraven has been studying since the 1970's. 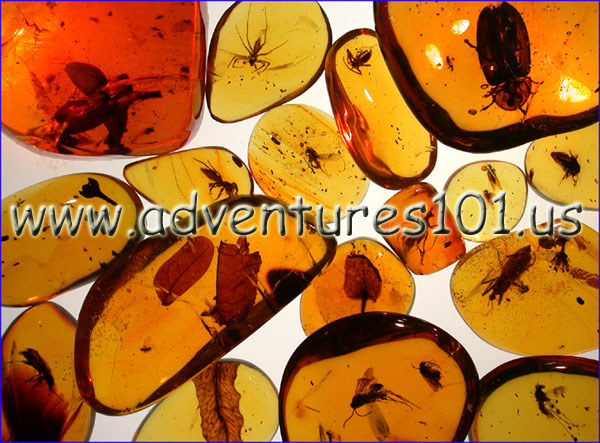 There are both late Cretaceous and early Paleocene exposures that contain amber. We have collected amber in these localities many times and have gathered many pounds from 'glory hole'. To date we have found only 1 small geologically compressed Thrips in all the amber we have collected, probably due to the fact that most of the inclusions have become 'smushed' due to geologic activity on these deposits. None the less it is always exciting hunting for well preserved clear amber gemstones in Wyoming! - please enjoy the photos.